The Body of Christ is in need of members who are spiritually mature. All of us begin at the New Birth as spiritual babes in Christ, but God doesn't intend that we stay that way. His desires is for us to grow into Christian maturity. In his book Growing Up, Spiritually, Rev. Kenneth E. Hagin compares stages of spiritual growth to those of physical growth. This book will help you locate where you are spiritually and then show you how to grow into the next stage of spiritual development. You won't be the same after reading and receiving the message of Growing Up, Spiritually, and the Body of Christ will be strengthened as you grow and develop in God! By applying the principles outlined in this book, you will learn: *how to locate yourself in your spiritual walk. *how to walk in close fellowship with your Heavenly Father. * the difference between divine love and natural human love. * the biblical characteristics of the natural man, the carnal man, and the spiritual man. * the importance of the correct spiritual diet. Growing Up Spiritually by Hagin Kenneth E was published by Faith Library Publications in March 1982 and is our 22466th best seller. 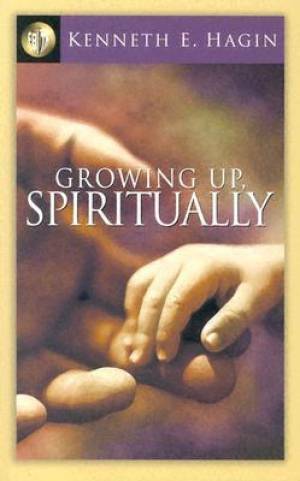 The ISBN for Growing Up Spiritually is 9780892765041. Be the first to review Growing Up Spiritually! Got a question? No problem! Just click here to ask us about Growing Up Spiritually.